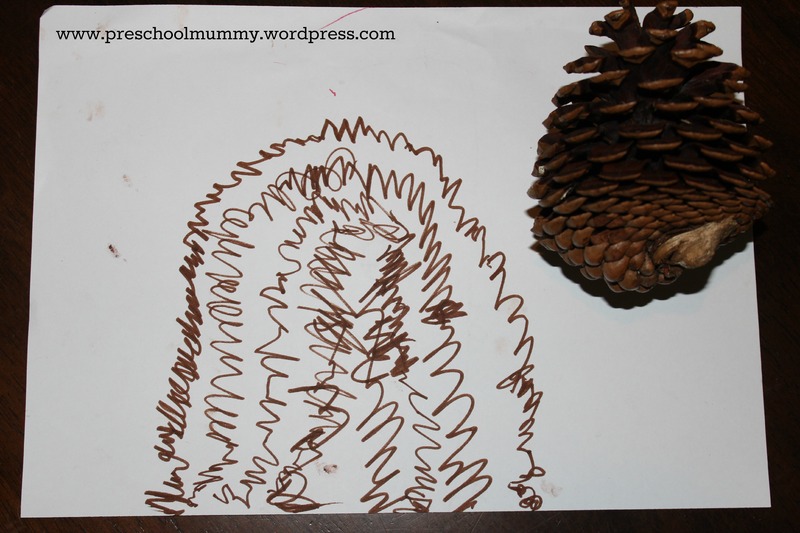 One of the themes which is central to the Reggio Emilia approach (my favourite educational philosophy) is the use of natural materials in children’s play. At our place, we love to play outdoors; collecting, exploring, imagining, seeing, hearing, touching. We also have a designated space inside which we call the Nature Table. Our home is on the smaller side, so this unassuming white table is often repurposed – as a craft table, a literacy station, a drawing table or a puzzle table. However it’s almost never used as a dining table, as our children usually eat meals with us at our family table. I wanted to share how simple it is to create a nature table at home, and some ways your children may enjoy using it. My boys collected most of the materials from their Nani’s garden after their egg hunt on Easter Sunday (even the “driftwood” – who knew that could be found in suburbia? But alas, that’s what Master 4 tells me it is!). Our shells were store-bought, from the discount variety store, as were the magnifying glasses. The fresh flowers were selected from our neighbour’s garden after Master 4 asked her *really* nicely. We placed them in water in an empty spice jar. Everything in our collection is hardy – the magnifying glasses are indeed made of glass but have been rigorously tested for possible breakage by Master 2. We keep the sea shells in a plastic jar to keep from small hands (and mouths). The glass spice jar accommodating the flowers is, of course, susceptible to breakage. However, displaying items in glass vessels is part of the Reggio Emilia experience. Before you go thinking I’ve gone nuts for allowing my kids near real glass, it’s only down when the preschooler’s the only one playing. have paper and drawing equipment readily available near the nature table. Tonight while I was cooking dinner in our adjacent kitchen, my preschooler sat down and illustrated two items from the nature table. 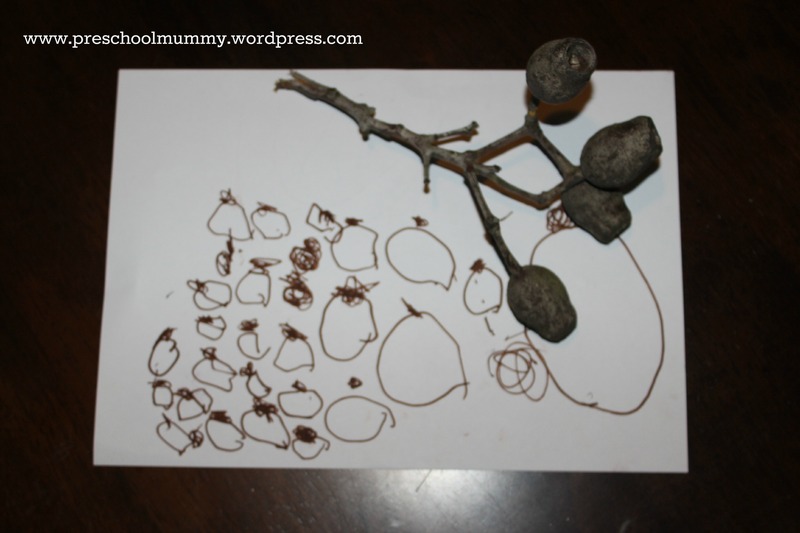 encourage your child to sort the materials according to size, shape, texture, weight, colour. smaller loose objects like shells or stones are great for mathematics play: counting, grouping, ordering, pattern-making. 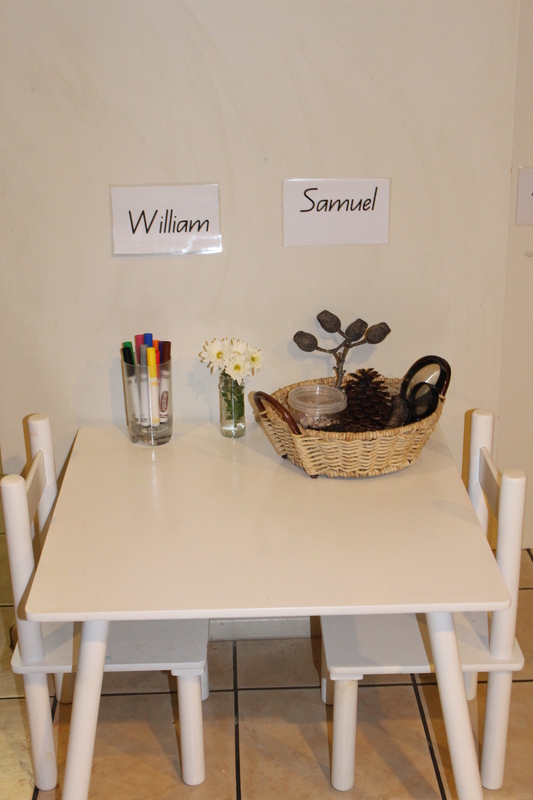 literacy play – have your child label the items, using masking tape and a marker (even if they can just write the initial sound, or draw a picture), or have your child hide an item under a piece of fabric and play a description/guessing game. 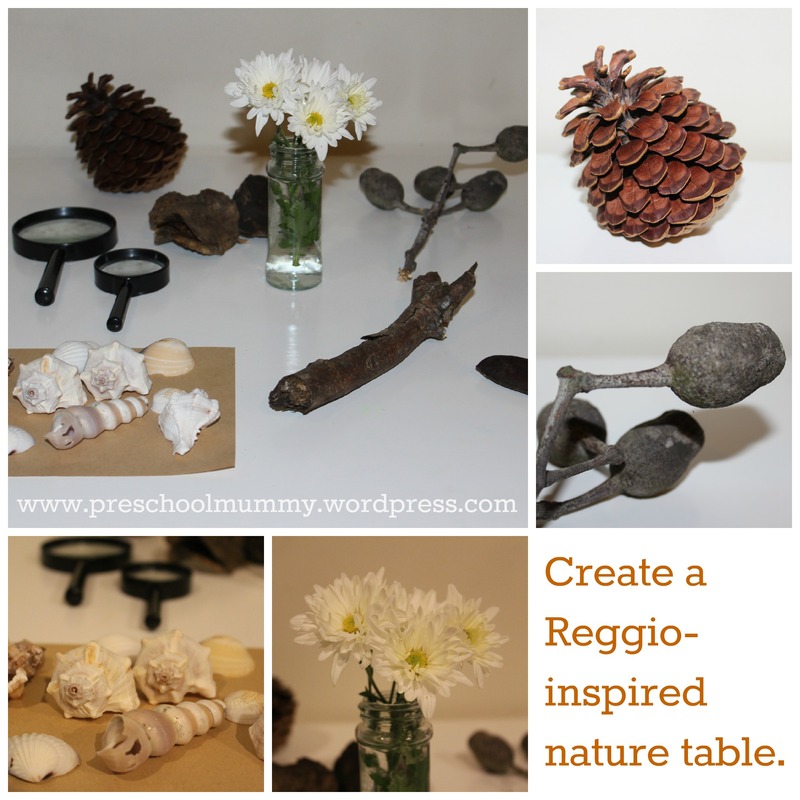 As I’m finding more as I go along enjoying my time at home with my children: a little bit of Reggio goes a long way! Happy playing! 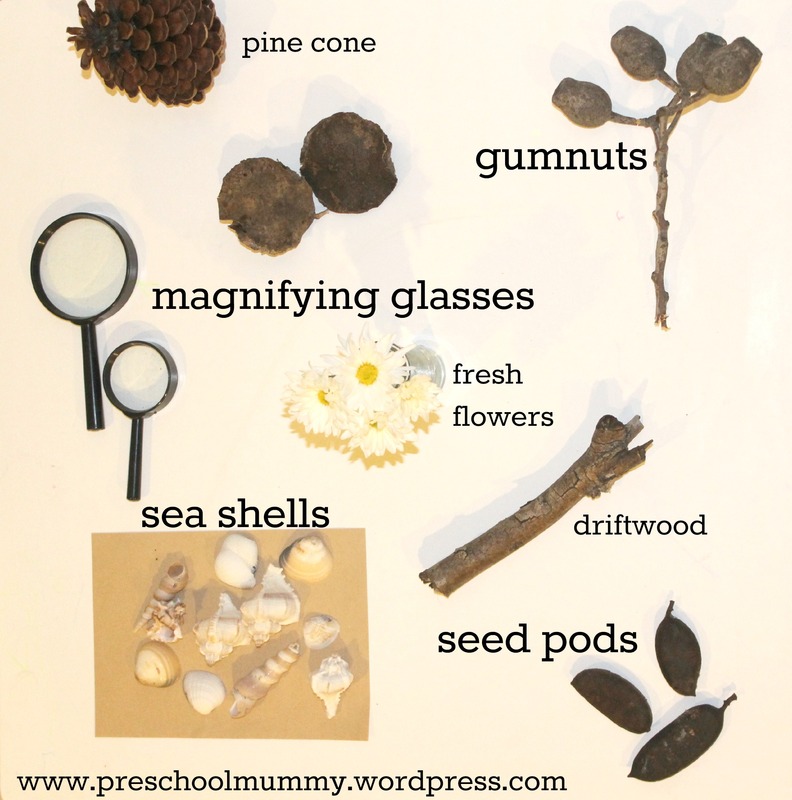 What’s your favourite find from nature and how do you incorporate it into your play? Previous Post My baby girl is hiding in this ad.